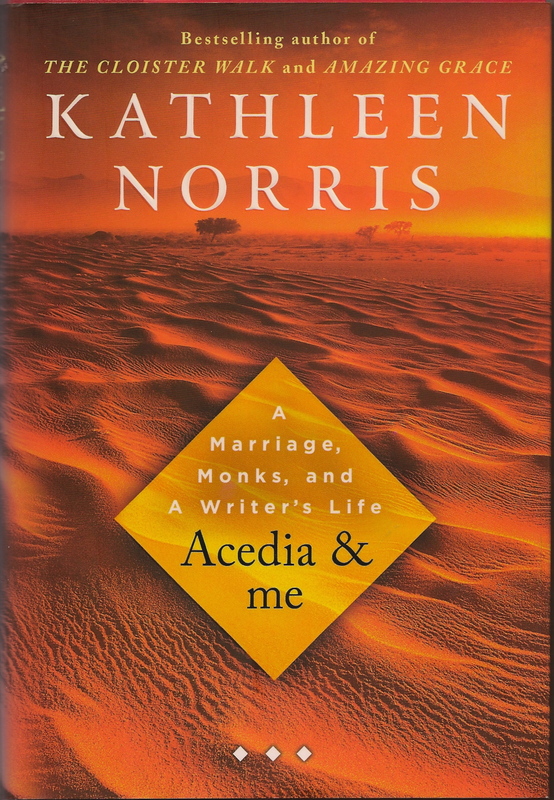 I’ve just finished working my way through Acedia & me: A Marriage, Monks, and A Writer’s Life by Kathleen Norris. It’s the last book in the “Take and Read” theological book discussion group I’ve been part of this year and is up for conversation tomorrow evening, along with the usual fabulous desserts. This book has been widely reviewed, so I’ll save myself long explanations, except to say that Norris sets out to rescue the word/concept “acedia” from centuries past, to bring it — along with the wisdom of the monastics which she has come to treasure — into contemporary use and understanding. Acedia is a broad term, even slippery, it seems, but it generally means soul-weariness, indifference, sloth. Over time the “noonday demon” of acedia that plagued the monastics, tempting them to despair over their commitments, turned into a fashionable cultural melancholy. Today it masquerades as “restless boredom, frantic escapism, commitment phobia, and enervating despair”: essentially the inability to care enough about the right things. As described throughout her book, acedia often sounds an awful lot like depression, but Norris insists it’s not the same. She acknowledges, however, that the difference will need to be carefully discerned. It seems to me, in fact, that if it’s anything, this is a book about discernment. I’m a fan of Kathleen Norris’s poetry and other writing (her books include The Cloister Walk, Amazing Grace: A Vocabulary of Faith, and Dakota: A Spiritual Geography), so I came to this book with fairly high expectations. I confess I was disappointed. It consists of a great deal of exposition on aspects of acedia and its history, but there are also pieces of Norris’ own story — of her adolescent soul-weariness, of her marriage to David J.Dwyer, of his illness and death, of her grief and widowhood. I found myself relieved whenever these passages of narrative appeared. I hope the reason is not some sloth of my own that wants story over study, but to me the expository parts seemed variously repetitive, confusing, and disjointed — wearing their vast research as collage instead of a journey — and too often (for an author who is a poet) plodding in their execution. As I plodded along myself, trying to understand the whole business of acedia, which became not clearer but more sweeping and eventually seemed to underlie nearly everything that’s wrong with contemporary life, I kept trying to figure out what was bothering me about what I was reading. I concluded it was a problem of the book’s organization. I wished that instead of making the personal narratives illustrative of the notion of acedia, Norris had simply let her discoveries about acedia serve her own story, tucked in here, tucked in there. Further, although I found the wisdom of the monastics on acedia compelling, I was not persuaded that their assessments of what tempts and troubles us, and their solutions to the same, were necessarily sound enough to lean into without reservation. Then again, maybe it was all just a matter of timing. I might have saved the book for a down time, but I had to have it finished for tomorrow. The weather has been so gorgeous these last days, the Easter lilies on the coffee table gorgeous too, the fridge full of Easter leftovers to make this week’s food prep almost effortless, and then there was the music of Haydn transporting my thoughts upward while I dispatched (in breaks from reading) piles of ironing that had accumulated. Acedia? It didn’t seem possible! Still, I’m glad to have “been assigned” this book. Two poems that Norris includes — “The Higher Arithmetic” by her late husband David Dwyer and one of her own about barren women, a black cat, and the laundry — seem almost worth the price of it. Norris also awakened my interest in knowing more about the Desert Fathers and Mothers, and I certainly needed her reminder about praying the Psalms. I used to practice this quite faithfully but lately it’s been too hit and miss. To the Benedictine Luke Dysinger, the psalms are “a vision of the whole of creation” and “the training-ground of the Christian contemplative.”…. Every emotion is expressed, as humanity is laid bare before God and everyone…. If acedia is my primary temptation…praying the psalter [is] a tried-and-true means of battling it…. I’ll be interested to hear what our discussion leader and the rest of the group will have to say about Acedia & me tomorrow. I’ll let you know. And I’d be interested in the reactions from those of you who have also read this book. This entry was posted in Books, spirituality and tagged Acedia, Acedia & me, depression, Kathleen Norris, Take and Read by doradueck. Bookmark the permalink. Like you, I had high hopes for this one. I had read all of Norris’s other books and was looking forward to this one. Like you, I was disappointed. It felt very scattered and disorganized. I didn’t even finish it. Perhaps I will give it a try again someday. I do think the topic is a very important one and very relevant in postmodernity. Thanks, Ryan. I’m curious what it is about postmodernity that you feel makes this topic — acedia — especially relevant. I suppose I just see a lot of the commonly-cited rootlessness and drifting out there (a kind of anomie, perhaps?). Some have associated this with the abandoning of belief in any kind of larger meaningful story or metanarrative to be a part of. I also see it with our increasing dependence upon (enslavement by?) technology. Numerous studies have come to the conclusion that many of us live in a state of virtually perpetual distraction and are increasingly unable to devote sustained attention to single tasks. There are probably a few words that could be used to describe the feeling you get after uselessly frittering away hours on the internet, but I think “acedia” or “sloth” would be among them. This was the first Kathleen Norris book I read. Like you, I read the sections and about her career, marriage, and grief more carefully than the rest. I too felt my understanding of acedia grow fuzzier, rather than clearer, but I did find many good quotes for a sermon I was writing at the time on “discontentment.” If the rest of her books are better, then I look forward to befriending them too. With discontentment so close/overlapping with acedia, at least as I understand it, the book must have been rich in sermon quotes indeed! I’m looking forward to befriending some of the monastics.